“I've got to fly to St. Somewhere” singer Jimmy Buffet once crooned. And for many who harbor similar escapist daydreams, visions of that loosely-defined Caribbean paradise conjure up clear waters washing over coral reefs and lapping golden sands. Add in a historic port town, a dormant volcano, a few beach bars and some friendly locals, and the fantasy is complete. But on the island of St. Kitts, this description isn't a fantasy, it's an every-day thing. St. Kitts offers uncrowded and undeveloped beaches and shorelines on both the Atlantic and Caribbean coasts. 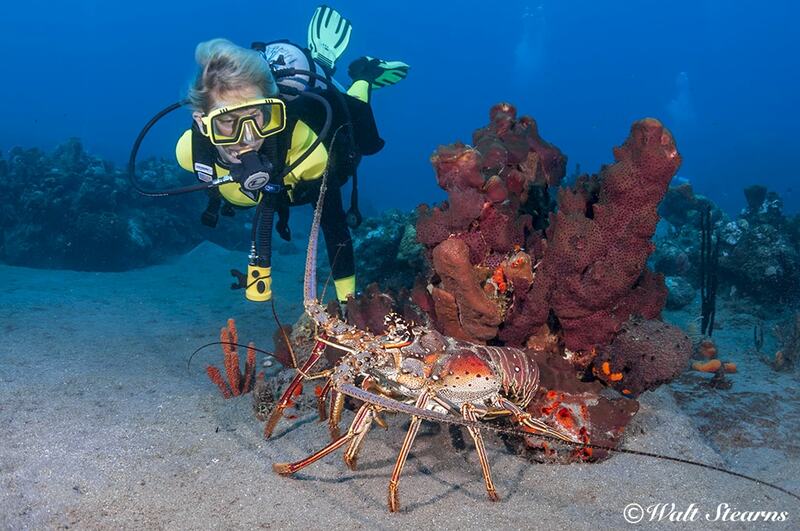 Many dive sites in St. Kitts offer an enticing combination of easy conditions and interesting marine life. Long off the tourism radar, St. Kitts is now an up and coming star on the Caribbean diving and tourism scene. This quiet and scenic island, which clung to its agricultural roots until the early 2000s, is now welcoming vacationers to resorts that combine natural charm and warm hospitality with access to a wealth of underwater adventures and natural attractions. Divers will find a diversity of sites to explore, from shallow reefs and coral-encrusted wrecks to volcanic finger ridges and canyons winding into the deep. And during surface intervals, there's plenty to keep divers and their non-diving companions busy with everything from shopping and sight-seeing excursions to challenging hikes and zipline thrills. 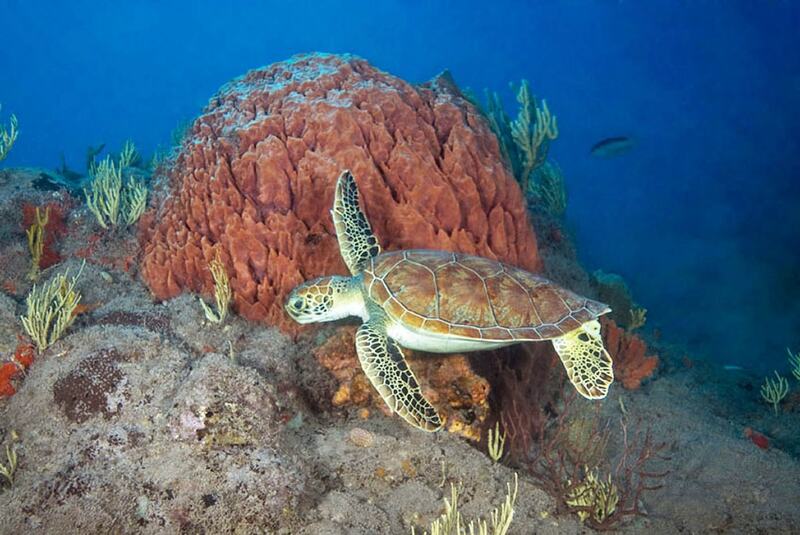 Turtle are common visitors to sites such as Paradise Reef. Drop into the water at most any point along the coasts of St. Kitts you will likely find coral growing on volcanic slopes that range from gentle slopes to steep drops. There are more than 60 square miles of fringing and deep reefs surrounding St. Kitts and its sister island of Nevis. 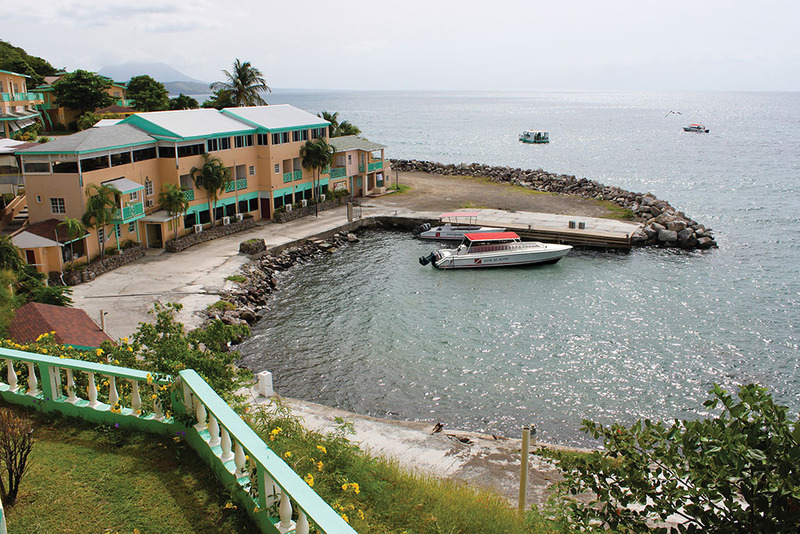 Most diving activity remains focused along their west coast, near the capital of Basseterre, where there are more than two-dozen sites within an easy boat ride of the shore. These sheltered venues are ideal for both new divers and underwater photographers, and profiles are relatively shallow, currents are nearly non-existent, and the sea floor teams with unique macro life such as frogfish, seahorses and sailfin blennies. Night dives are particularly productive for critter spotters. 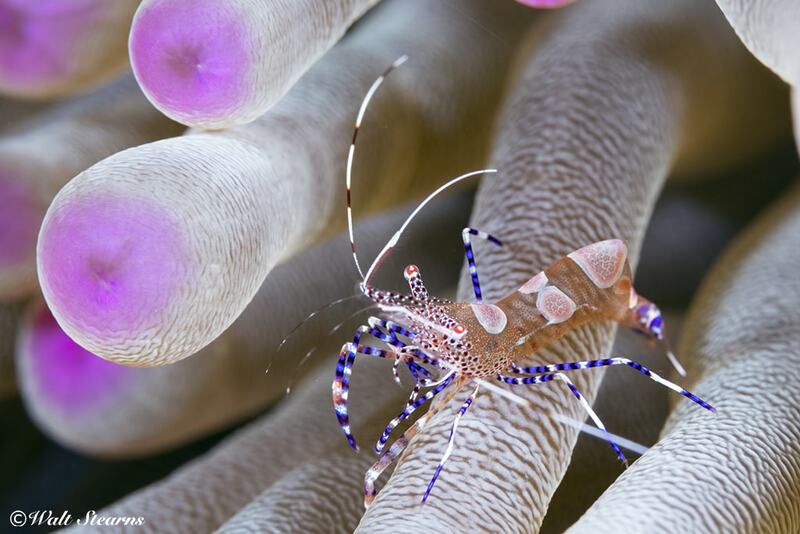 Underwater photographers will find a wealth of small and intriguing subjects in the waters of St. Kitts. A favorite wreck is the MV River Taw, a 144-foot freighter that sank in a depth of 50 feet less than a mile from shore. Now broken open, the superstructure is heavily encrusted in coral, and the wreck is a favorite with fish watchers and photographers. Sea turtles, angelfish and queen triggerfish make lazy passes around the upper decks, while the sands near the keep hide squirrelfish, purple mouth morays, and flying gurnards. The shadowed recesses of the bow hold three species of black corals usually seen only in deeper water. Not far away, the Talata is another island freighter that sank in 1985 while at anchor. Its battered profile rises from 65 feet to 35 feet, attracting schools of glass-eyed snappers and black bar soldierfish. Near the vessel's keel, divers can find thermal vents that radiate heated water from deep underground. The third wreck in this area, the Corinthian, is fully intact 60-foot tugboat resting at a depth of 65 feet on a sandy bottom. After exploring the wreck, and taking in the colonies of garden eels in the surrounding sands, divers can extend their bottom time by moving to an adjacent reef that rises to 35 feet. The massive 17th-century fortress known as Brimstone Hill is one of the island's most famous landmarks. Reef dives are conducted at depths from 35 feet to beyond 100, and the mid-level to deeper reefs typically hold the most coral cover and fish life. In addition to the southern sites, dive operators will sometimes visit reef systems on the island's westernmost coast, which is known for having excellent water clarity. Two favorite areas are Paradise Reef and Sandy Point. Both offer dense growths of brain and star coral, with slopes and walls that drop well past 100 feet, and include volcanic formations such as clefts and ridges that add interest to the terrain. Another area often visited is the broad seamount known as Monkey Shoals, which sits several miles west of the island. This structure rises to within 45 feet of the surface and supports dense growths of both hard and soft corals. Signs of the islands agricultural past are evident in the stone towers that were once windmills. 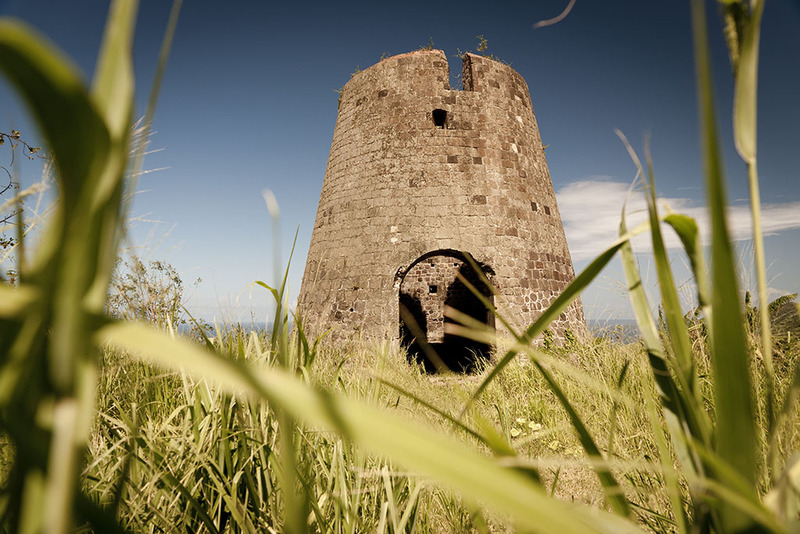 Colonial traditions and agricultural roots remain in evidence evident in the culture and landscape of St. Kitts. The island's most iconic landmark is the sprawling fortress known as Brimstone Hill. This UNESCO World Heritage site, which dates back to 1689 earned the nickname the 'Gibraltar of the Caribbean," and has a rich history of battles won and lost. Divers who learn the history of the fort will have an added bonus when they dive the nearby site known as Anchors Aweigh, where more than 20 ancient anchors lie where they were abandoned by ships that had to “cut and run” when they realized they were within cannon range of the fort. 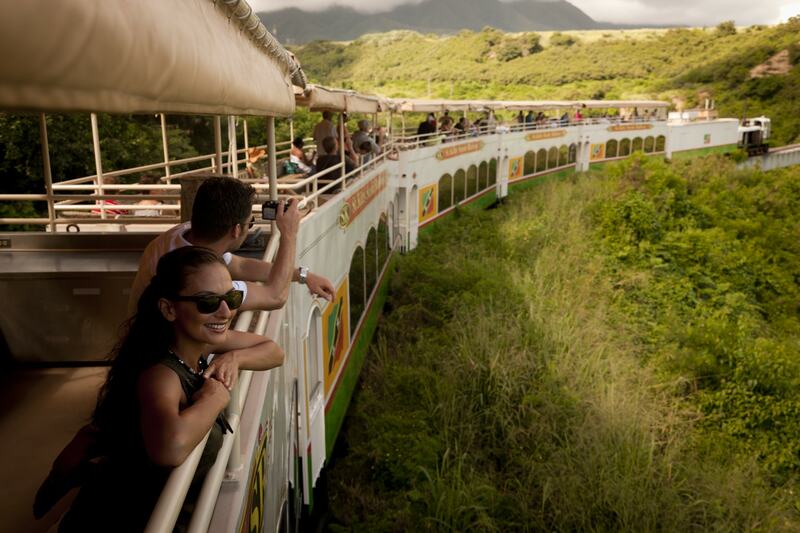 The St. Kitts Scenic Railway runs along the coast on tracks that once carried sugar cane to the mills. Long after other islands in the Caribbean turned to tourism, St. Kitts remained one of the region's leading producers of sugar cane. Many of these green fields now lay fallow or have become pasture land, but evidence of the sugar trade can be found in everything from former waterfront warehouses and former plantation homes to the stone towers of abandoned windmills. The island's most iconic legacy of this period is the St. Kitts Scenic Railway, known as the “Last Railway in the West Indies.” The train that once hauled cane cuttings to the mills has been restored to carry passengers on an 18-mile journey that hugs the island's northeastern coastline to take in spectacular vistas of the ocean, surf, cliffs and lush vegetation. 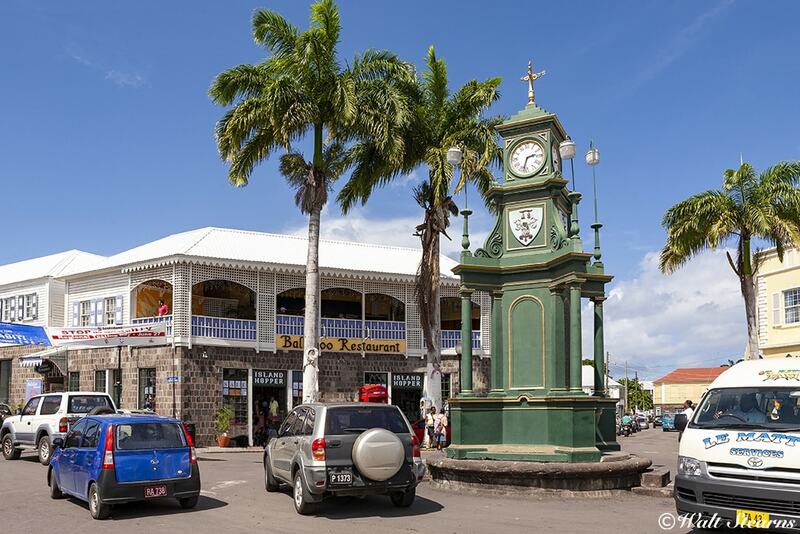 The Berkeley Memorial Clock sits in the middle of Basseterre's central roundabout known as the Circus. 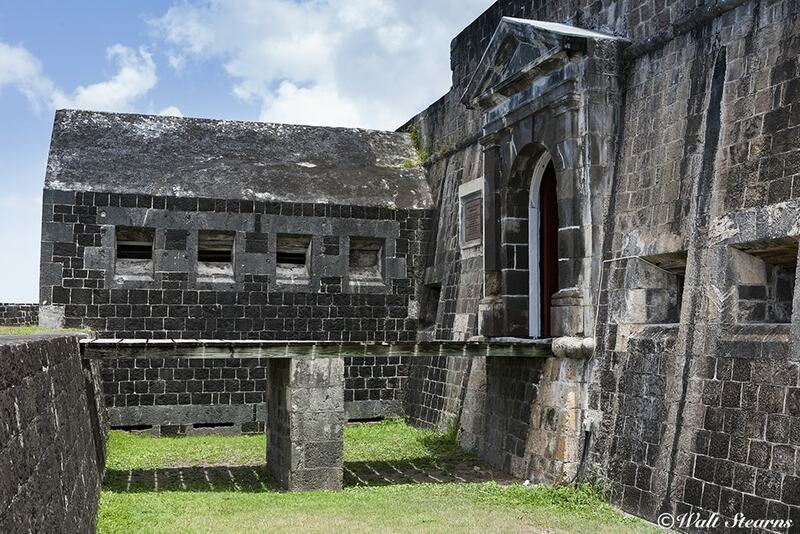 St. Kitt's capital city, Basseterre, is one of the oldest towns in the Eastern Caribbean. A walking tour will reveal Victorian and Georgian style architecture, and Colonial and Empire-era monuments such as the Berkeley Memorial Clock Tower and Independence Square. More history awaits at the newly restored Fairview Great House & Botanical Garden. Originally built in 1701 by the French, the house has a rich history, and now provides an authentic glimpse of life in Colonial times. Visitors can also stroll the 2.5-acre botanical gardens, and learn the history of rum making, followed by a chance to taste several local flavors of the libation. 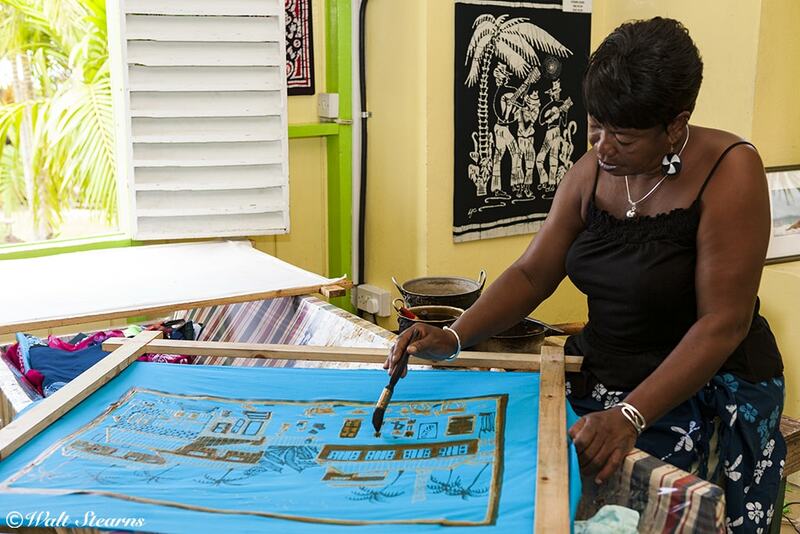 Shoppers will want to plan a visit to Romney Manner, which is home to Caribelle Batik, makers of the Caribbean's most sought-after batik textiles and fabric products. Romney Manor is home to Caribelle Batik, which uses traditional techniques to create one of the Caribbean's most sought-after fabrics. Nature lovers looking for a challenging adventure can take on the Mount Liamuiga Volcano Hike. This eight-mile round-trip begins with a trek through lowland forests where monkeys perch overhead and then climbs the slopes of the 3,800-foot volcano to reveal a hidden inner crater. The fewer ambitions will find trails that meander from village to village, follow the coastline, or lead to hidden bays. Birders can head to one of the island's natural ponds nine large ponds which serve as habitat for birds ranging from giant frigate birds to tiny green-throated Carib hummingbirds. And, for a personal taste of flight, there is now a zipline park that carries riders up to 250 above the ground on soaring quarter-mile long runs. 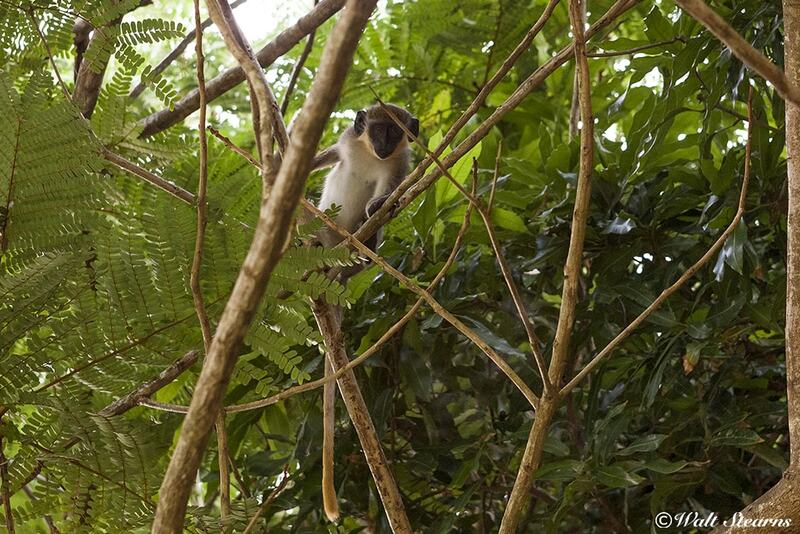 Originally brought from African, vervet monkeys have lived on St. Kitts & Nevis for over 300 years. 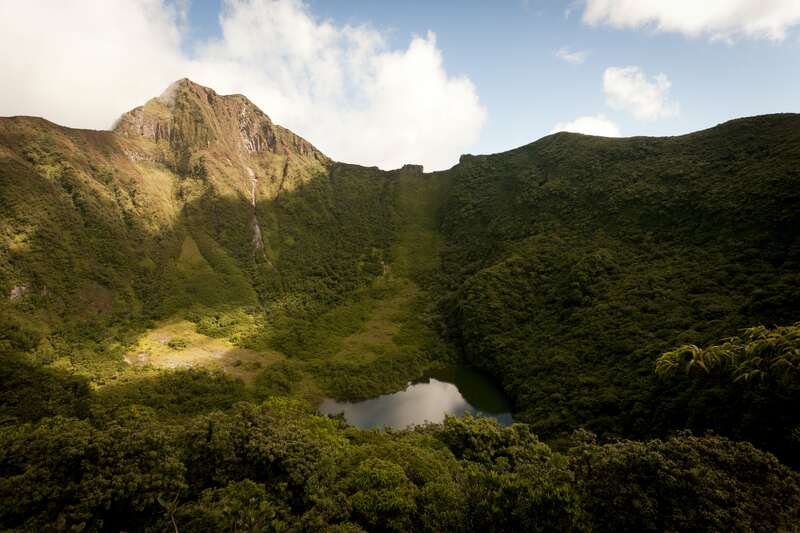 The interior crater of Mount Liamuiga shelters a hidden rainforest and lake. 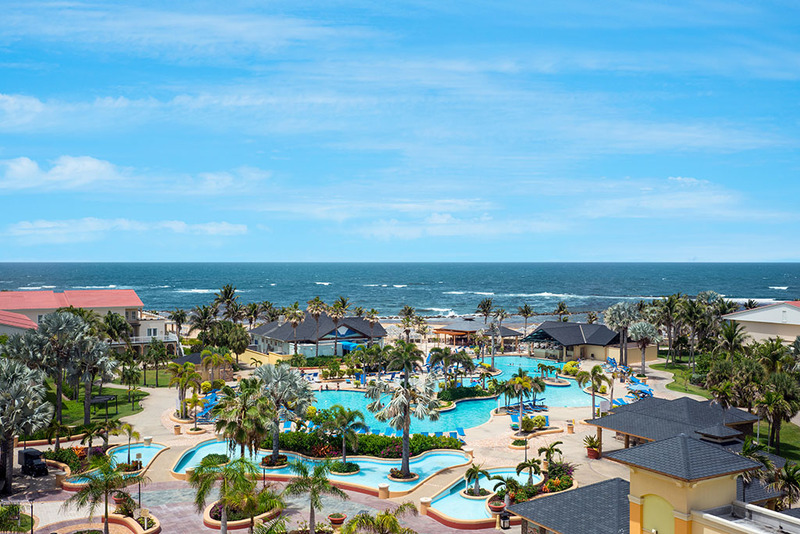 Fresh from a recent property-wide renovation, the Royal St. Kitts Hotel is a favorite with divers who want to combine bottom time and topside recreation. This family-owned resort is located in the scenic Frigate Bay region of St. Kitts, close to excellent restaurants, shops, bars, an 18-hole championship golf course, and beaches on both the Atlantic and Caribbean sides of the island. On-site amenities include in-room kitchenettes, complimentary Wi-Fi access, flat-screen TVs, two pools, a fitness center and two restaurants. 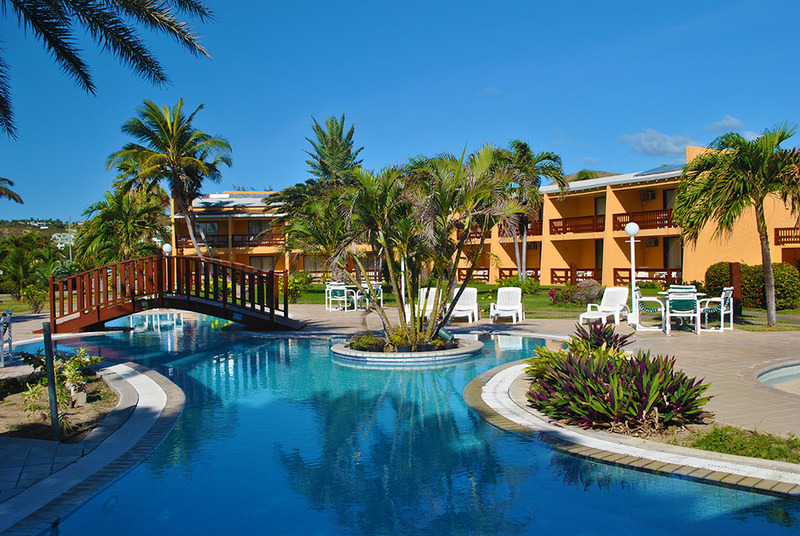 The hotel is just a short shuttle ride from the island's capital city of Basseterre, as well as the facilities of Dive St Kitts. With eight restaurants, three pools, a premier spa, fitness center, casino, championship golf course and private beach, this property truly does deserve its “Resort” title. 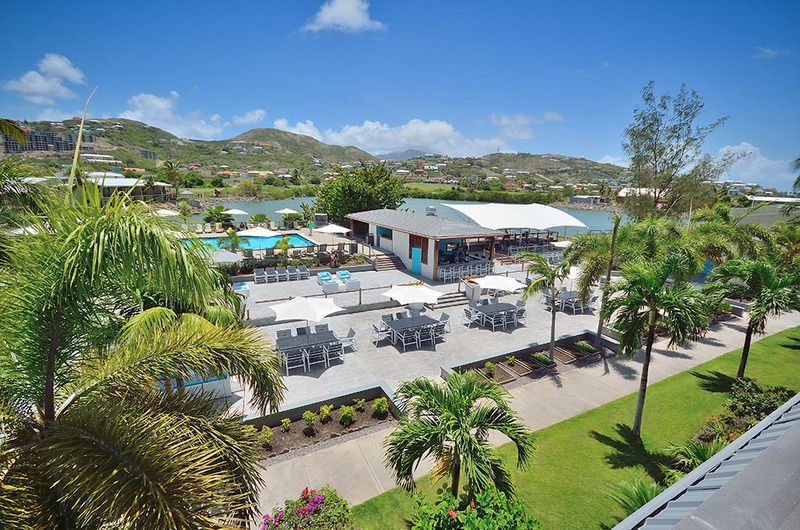 The Marriott is the premier property in St. Kitts' Frigate Bay area, offering 392 updated rooms and a wealth of amenities for both families and adults-only travelers. On-site dining options range from a beach-casual snack bar to specialty Italian, sushi, seafood and steak restaurants. There's a kid's club, daily organized activities and a range of available day trips and tours. Divers are just a quick transfer away from boat departing from the Caribbean side of the island. 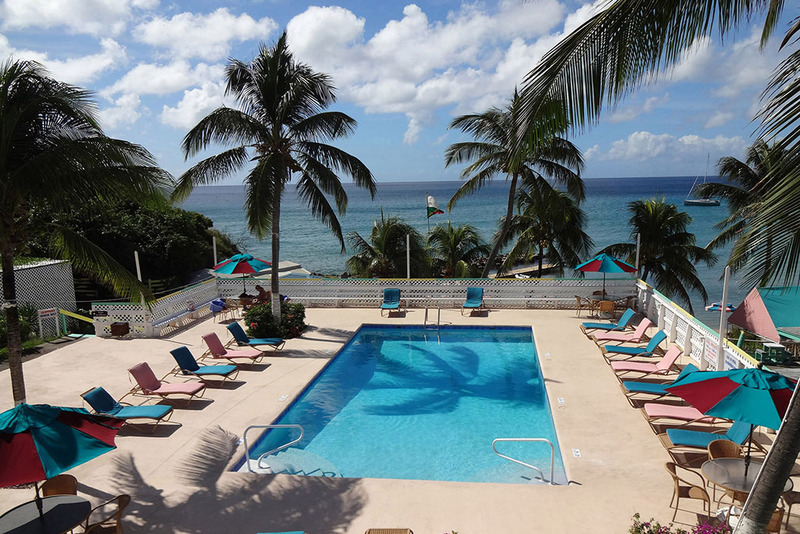 Described as an informal, relaxing and sociable low-rise resort, the 94 suites and rooms of the Sugar Bay Club are is set in five acres of landscaped gardens on the edge of a golden sand beach in the lively Frigate Bay area. It is ideal for divers seeking a value-conscious vacation in St. Kitts. The property includes two swimming pools, a duty-free liquor store, a souvenir shop, an Express Mart and five restaurants offering a variety of dining options. Accommodation choices include Deluxe Ocean Front Rooms, and studio and two-bedroom cottages with fully-equipped kitchenettes. This 46-room boutique hotel is made up of seven two-story buildings nestled in a lush tropical setting on the Caribbean coast. Guests are rewarded with direct water views from rooms and suites, and convenient access to the facilities of on-site Dive St. Kitts. Daily reef and wreck dives depart from the hotel wharf, and the shop also offers kayak and snorkeling trips. The hotel provides a private beach area, and the Sunburst restaurant is known for its fusion cuisines, which showcase a mix of European, American and West Indian influences. Packages include accommodation, meals and diving. 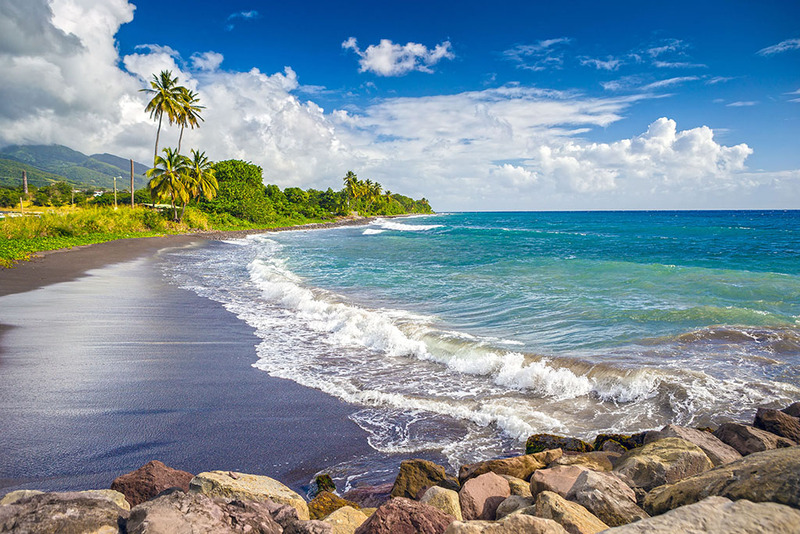 With competitive rates, dozens of direct and easy-connect flights and a number of first-class resorts to choose from now is the time to discover St. Kitts and to delve into its underwater treasures. We have created special stay-and-dive packages with a number of properties and can tailor a vacation package to suit you, your family or your group needs. To learn more, give our expert agents a call at 800-330-6611 or send a note to sales@caradonna.com.